The most commonly grown of this small genus, Arpophyllum spicatum is often called the ‘Candlestick Orchid’. 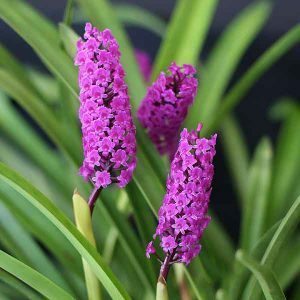 The flowers appear as tall spikes and they are a a remarkably hardy orchid, growing well in a sunny potion. These are naturally found as epiphytic and terrestrial orchids and are flund from Mexico through to Columbia. A. spicatum with its lilac to purple flowers will reach around .5 to .7 metres, upright strap like foliage and long lasting flowers. Flowering period is from mid autumn to early winter. Like many orchids, Arpophyllum spicatum like to be a little pot bound, it will flower more reliably with a restricted root run. It is an orchid that can be grown in containers as well as hanging baskets, it also grows well in the garden if left undisturbed. In containers use a potting mix that will allow the plant to be left for a number of years. The growing medium needs to moist, yet well drained. Try mixing some perlite, charcoal and fine to medium coir peat pieces with the potting mix. A fine pine park mix with some good organic material is also suitable. Moisture is essential, and we prefer a permanent position in the garden to pot culture. They do like sun, so good morning sun is essential for flowering.